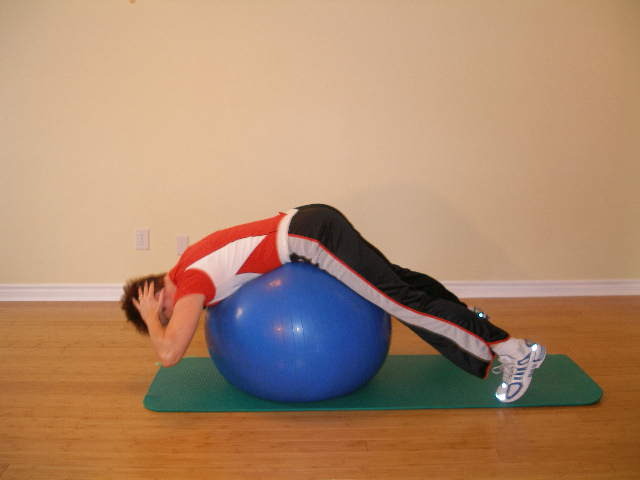 Start this ball exercise by lying prone over the ball with chest lowered. Your waistline should be centred over the top of the ball. Feet are resting on the floor about shoulder width apart. Place your hands behind your head but don't interlace your fingers. If the ball feels like it's rolling away with you on it, move it forward a bit before starting or prop your feet against a wall. Slowly raise your chest up off the ball. Keep your chin tucked as though you were squeezing an grapefruit between your chin and your chest to stabilize the neck. Back extensors, glutes, deltoid, scapular retractors. Pull your shoulder blades together and your elbows back as you reach the top. Be careful not to pull your head forward. Keep neck in neutral position at all times. Work only within a range where you feel in control - don't hyper extend your back. An easier version of this is Back Extension 1. Add 1-2 kg wrist weights. This is a dynamic back extensor strengthening exercise particularly good for those that sit at a desk all day. Sitting at your computer muscles on the front of your chest and shoulders shorten, pulling you forward. Gluteal and back extensors get weak from sitting. This exercise addresses these weaknesses in strengthening your scapular retractors, back extensors, and gluteal muscles.